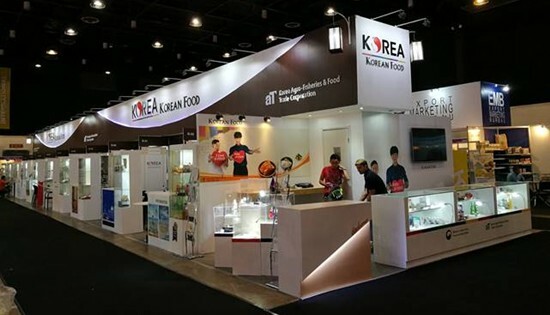 PASAY CITY – Twenty-four Korean companies showcased their leading food and products at IFEX, making it the top foreign exhibitor country at the three-day international food trade fair which started on Friday, May 19, and runs until Sunday, May 21. Among the group are the top two Korean leading firms in food distribution, manufacturing and service: the CJ Group, a conglomerate that holds both CJ Freshway and CJ Cheiljedang; and the Daesang Corporation, which have combined annual revenue of around $19.8 billion dollars. CAMP LUKBAN, Catbalogan City – On May 13, 2017 at 2 o’clock in the afternoon, the troops of 803rd Infantry (Peacemaker) Brigade while conducting security patrol in Brgy De Tubang, Silvino Lobos, Northern Samar apprehended a 12-year old boy carrying a half sack of rice that concealed 20 rounds of 5.56 mm ammunitions, three (3) cartridge 7.62 mm, linked for M60 machinegun and two (2) cartridge 5.56 mm linked for K3 machine gun. After some interview, the child was immediately turned-over to Provincial Social Welfare Development for proper custody and brought to Catarman Provincial Hospital to check his health condition. This kind of incident is a clear manifestation that the NPA terrorist group violated the International Humanitarian Law stating that children ages 18 below are prohibited to participate in any hostilities and carrying supplies that could merely put their lives into danger. Thus, Maj Gen Farnacio said, “Let us give our children the chance to grow up while peacefully learning from their youthful experiences and contributing in their own unique ways. NPA should stop recruiting and using minors for their illegal activities”, Farnacio added. CAMP LUKBAN, Catbalogan City – The 43rd Infantry (We Search) Battalion again clashed with more or less 20 NPA rebels at Barangay Mahayag, Matuguinao, Samar on May 16, 2017 at 9:45 in the morning that resulted to the death of Corporal Renjie P Ada (Inf) PA while undetermined casualty on the enemy’s side. The 15-minute firefight occurred during the combat operation going to the location of the armed group which is according to the concerned villager, asking for assorted foodstuffs and medicines in their area. A pursuit operation is being conducted to track down and apprehend the rebels. Army units in nearby areas were ordered to conduct checkpoints along possible entries/exits of withdrawals of the enemy and to verify possible accommodation of wounded enemy in nearby hospitals. Your Army is sincere in its offer of peace. We will ensure the personal safety of those who will choose to lay down their arms and peacefully return to their families. Lay down your arms and return to the comfort of your families and friends. Live peacefully and take care of your children as they grow and become productive members of the community. Massive military operations will be relentless against these lawless elements as long as peace and development in Eastern Visayas region is at stake. MAKATI CITY – Philippine exports for the first quarter of 2017 grew by 18.34% after it reflected double-digit growth for March 2017 with 21% total increase amounting to $5.58 billion compared to $4.61 billion recorded value in the same period in 2016, Department of Trade and Industry (DTI) announced. In the recent report of the Philippine Statistics Authority (PSA), the increase for March 2017 exports data, an almost double of the 11% year-on-year growth figure posted in February this year, further lifted the cumulative value of merchandise exports covering the period January-March 2017. “Increase for March 2017 exports marked the fourth consecutive positive growth in the value of Philippine merchandise exports since December 2016,” explained DTI Export Marketing Bureau Director Senen M. Perlada. For March 2017, electronics remained to be the country’s top export with total receipts of $2.80 billion, accounting for 50.2% of the total exports revenue in March 2017. It increased by 19.0% from $2.36 billion registered in March 2016. On the other hand, exports of manufactured goods were valued at $4.69 billion, accounting for 84.1% share of the total export receipts in March 2017, went up by 16.5% from $4.03 billion recorded in the same month last year. United States (including Alaska and Hawaii), with export receipts valued at $809.93 million, topped other countries as the Philippine top export market for March 2017. It is followed by Hong Kong with revenue amounting to $798.25 million, and Japan as third market with $762.43 million export sales. By economic bloc, East Asia registered to be the top destination of Philippine goods with 46.4% share to total exports, followed by European Union with 16.2% share to total merchandise exports. ASEAN ranked third with 14.9% share in overall Philippine exported goods. Against other trade-oriented economies, the Philippines landed at third place among the top export performers for March 2017, a major leap after landing 9th place for February 2017. Malaysia topped the list with 24.1% export growth followed by Indonesia with 24% for March 2017. Covering the first quarter of the year, exports of Philippine electronic products increased significantly by 15.27% while non-electronic goods also posted +21.48%. Positive performance of the five out of nine subsectors of the electronics industry drive growth which contributed 96.65% share in the cumulative total value of the industry. Semiconductors, which grew +16.3% in the first quarter of 2017, remained to be country’s top electronics exports. Increase for non-electronic goods was driven by the triple-digit growths in Forest Products (+168.1%) and Coconut Products (+133.1%). The rest of the contributing commodities exhibited double-digit increases ranging from 18.7% to 89.4% except for Basketwork (+8.1%) and Travel Goods and Handbags (+7.6%). Except for Japan, cumulative value of export shipments to top market destinations of the country posted substantive growths in the first quarter of 2017. Combined markets of China and Hong Kong with a share of 23.6% which also grew by 35.94% topped the list of exports destinations. Second to the list with total 15.49% share was USA which rose by 13.66%; followed by Japan with 15.34% total share of exports which declined by 17.41%. In terms of year-to-date export growth, shipments to the Netherlands, which has 4.12% share in total exports, reflected the highest growth with 55.98%. CAMP LUKBAN, Catbalogan City – A tip from a concerned citizen on the presence of armed group in a community triggered the troops of 43rd Infantry (We Search) Battalion to immediately respond on May 10, 2017 at 10 o’ clock in the evening that led to a 10-minute fire fight between the military troops and communist terrorists in the boundaries of Barangay Camayaan, Silvino Lobos, Northern Samar and Barangay San Roque, Matuguinao, Samar. This resulted to the death of Pfc Jaime C Mabini Jr (Inf) PA while undergoing medical treatment at a nearby hospital and the recovery of one (1) body count from the enemy side. As of this time, nearby military units and CAA Detachments were alerted to conduct checkpoints along possible entries/exits of withdrawals of the enemy. Further, the 8ID calls for the active participation of the community in immediately informing nearby military units on the presence of this terrorist group in their area. We are grateful to serve and protect our beloved people of Eastern Visayas until our last breath, committed to achieve the long lasting peace in the region. Despite of our losses, the 8ID assures that as long as the presence of the armed group still persists in the far flung barangays conducting mass recruitment, collecting revolutionary taxes and instilling psychological fear in the hearts and mind of the populace, we will continuously conduct massive combat operation. PASAY CITY – Senator Alan Peter Cayetano is proposing to adjust the compulsory retirement age for the country's uniformed men and women from fifty-six (56) to sixty (60) years old. Cayetano recently filed a measure seeking to adjust the compulsory retirement age for officers and enlisted men of the Armed Forces of the Philippines (AFP), members of the Philippine National Police (PNP), uniformed officers and non-officers of the Philippine Coast Guard (PCG), and members/officers of the Bureau of Fire Protection (BFP) and the Bureau of Jail Management and Penology (BJMP). “We need more competent and dedicated uniformed personnel to assist our government pursue its programs to ensure peaceful, orderly, and safe communities," Cayetano said as he filed Senate Bill No. 1436 last May 4. Cayetano pointed out that the tasks performed by the personnel of the PNP, BJMP, the Philippine Coast Guard, and the BFP require long years of training and experience. He said he is confident that at age 56, these personnel can still fulfill the physical, mental, and psychological demands and rigors of their position. Under existing laws, civilian government employees are compulsorily retired at the age of sixty-five (65), while the retirement age for uniformed personnel is pegged at fifty-six (56). Currently, uniformed personnel who have accumulated thirty years of satisfactory service or who have reached the age of 56 are compulsorily retired. "Recognizing their indispensable role as protectors of the State and its citizens, the government has heavily invested in the training and development of the officers and members of these agencies," the senator stressed. “We need to maximize their years of experience and wealth of knowledge, harness their leadership skills and professional competence until the age of 60,” he added. Cayetano hopes that extending the years of service would also increase the number of qualified personnel in these respective offices. He noted that the long-term goal is to keep hardworking and dedicated uniformed personnel longer in service and to remove corrupt officials and scalawags who are destroying the image of the institutions that they serve. "The senior officials are in the best position to help our administration to lead the reforms in their respective agencies,“ Cayetano noted. “Additional years in service would also allow these officers to have more opportunities for career advancement,” he added. CAMP LUKBAN, Catbalogan City – On May 10, 2017 at around 6:40 in the morning, a fire fight ensued between the scout platoon of 78th Infantry (Warrior) Battalion and the NPA terrorist group at Barangay San Antonio, Hilongos, Leyte for about 30 minutes. Concerned villagers tipped the military troops on the presence of the NPA group at their barangay while asking for revolutionary extortion among the villagers. As a result, the military troops have recovered two (2) AK-47 rifles; six (6) magazines; 158 live ammunitions; 2 bandoleers; assorted food stuffs and medicines; and subversive documents. No casualty was reported on the government side while undetermined on the enemy side. Brig Gen Mendoza, Commander of 802nd Infantry Brigade has already coordinated with Police Regional Office 8 (PRO8) to conduct checkpoints along possible entries/exits of withdrawals of the enemy and to verify possible accommodation of wounded enemy in nearby hospitals. The 8th Infantry (Stormtroopers) Division assures the people of Eastern Visayas that the NPA terrorist group will not succeed on disturbing the peace and order in the region. Thus, the continued support of the public is greatly appreciated by the Command as a paradigm of a good rapport between the military and the civilian populace as partners for peace and development in the region. QUEZON CITY – Cognizant of the key role of local government units (LGUs) in promoting peace and order in localities, Interior and Local Government Officer-in-Charge Catalino S. Cuy said local chief executives (LCEs) should ensure that all local peace and order councils and committees are proactive and fully functional in each level of local government. In a directive, Cuy said that LCEs must create Local and Barangay Peace and Order Councils (LPOCs and BPOCs) and Anti-Drug Abuse Councils (ADAC) in the provincial, city/municipal and barangay levels as well as MASA MASID (Mamamayang Ayaw sa Anomaliya, Mamamayang Ayaw sa Iligal na Droga) teams and ensure that these are functioning and performing their roles and responsibilities as stated in all relative issuances. “Everyone must pitch in their share to eradicate illegal drugs and to attain lasting peace in the country,” he said. According the Cuy, the creation of such local committees are provided for in several issuances such as Section 116 of the Local Government Code, Executive Order No. 366, Section 51 of Republic Act 9165 and other DILG Memoranda. "The compliance of LCEs in safeguarding that these issuances are carried out is very crucial as it assures that efforts for peace and order, and illegal drugs are cascaded down to the barangays," Cuy said. Cuy said that LCEs should also make sure that the said committees will formulate their respective Peace and Order Plans (POPs) and Anti-Drug Action Plans (ADACs), and allocate substantial amount to support their operations. "Non-compliance, of course, merits proper sanctions to ensure that all parties are aware of their role in the campaign for peace and order, and illegal drugs," he said. Sanctions for non-compliance is suspension/withdrawal of the deputation of the National Police Commission upon consultation with the provincial governor and congressman concerned, pursuant to RA 8551; non-approval of the request of the LGUs for additional confidential funds granted by SILG; and sanctions provided by the existing laws relative to the non-performance and non-compliance of an LGU, including the officials of the barangay, in addition to the administrative case that may be filed. DILG Regional and Field offices shall collate monitoring reports of LPOCs, BPOCs and BADACs following the schedule of regional reporting. In the same directive, Cuy reminded LCEs of the deadlines of required reports. POCs accomplishment report must be submitted not later than July 15 and January 15 of the ensuing year for 1st and 2nd semester, while POCs secretariat accomplishment report and Peace and Order report, must be submitted not later than April 15, July 15, October 15, and January 15 of the ensuing year for the 1st-4th quarter respectively. On the other hand, the monitoring report for BADAC, allocation of substantial portion in the Barangay Budget and formulation of Barangay Anti-Drug Plan of Action must be submitted on or before February 15 every year. PASAY CITY – A Philippine Human Rights Action Plan under the Duterte administration for the next five years is already being prepared. Senator Alan Peter Cayetano reported this in his opening statement during the 3rd cycle of the Universal Periodic Review last May 8. The plan seeks to mainstream the government's human rights agenda in its development initiatives to protect all, especially the most vulnerable sectors, including but not limited to, the indigenous people, children, women, migrant workers, the elderly, domestic workers, persons with disabilities, farmers, laborers, and members of the LGBT community. It should be recalled that the Human Rights Plan of the past administration was crafted in 2012. The senator also highlighted the Duterte administration's effort to augment the budget of the Commission on Human Rights (CHR) from P439 million to P724 million. This year’s budget of CHR is the highest since 2005. “The provision of additional resources for CHR, the President’s most outspoken critic, shows that this administration supports human rights programs and initiatives," Cayetano explained. Additionally, Cayetano stressed that the issuance of an Executive Order institutionalizing the Freedom of Information in the executive branch as well as the installation of a direct complaint hotline - 8888 - to the Office of the President are clear proofs that President Rodrigo Duterte is for accountability in government. He also noted the government’s efforts in encouraging private sector participation in ensuring a more effective and sustainable rehabilitation and reintegration program for self-confessed drug users and pushers who surrendered. “The Philippine Government under President Duterte is committed to real change, to peace and development and to addressing the problems of poverty and inequality… We are committed to Change. We are committed to the rule of Law. We are committed to upholding human rights,” Cayetano concluded. 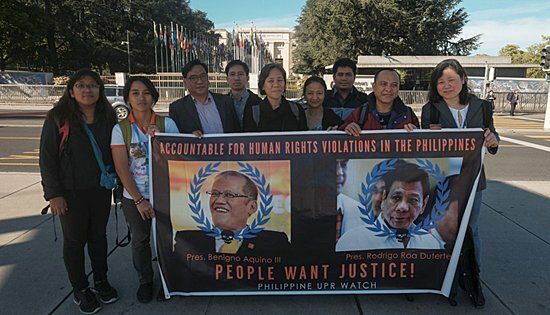 The Philippine UPR Watch delegation in front of the United Nations Building in Geneva call for a stop to extra-judicial killings in the Philippines in time for the third cycle of the United Nations Universal Periodic Review of Human Rights in the Philippines scheduled for May 8 in Geneva, Switzerland. BRUSSELS, Belgium – The Philippine UPR Watch delegation met with members of the European Parliament (MEPs) in an effort to share the human rights situation of the Philippines and enjoin their support for the Filipino people’s aspirations for just and lasting peace. Francesco Giorji, attending on behalf of Pier Antonio Panzeri, Chairperson of the European Parliament Subcommitee for Human Rights, assured the UPR Watch delegation of their support for the group’s calls for a stop to all Extra-Judicial Killings in the country. He also warmly welcomed ongoing efforts to push for the continuation of the Peace Talks between the National Democratic Front of the Philippines (NDFP) and the Government of the Republic of the Philippines (GRP). Giorji was accompanied by other members of the Sub-committee secretariat in separate meetings that were held at the MEPs’ offices. MEP Estefan Eck of Germany said that he will definitely relay the UPR Watch’s message to his colleagues at the Delegation for the Relations with the Lands of South-East Asia and the Union of Southeast Asian states (ASEAN). Eck is an independent and is from the Confederal Group of the United European Left - Nordic Green Left. Marie Christine Vergiat from France expressed her complete agreement that genuine peace in the country cannot be achieved unless the roots of the armed conflict in the Philippines are resolved. While acknowledging the high degree of difficulty of being a human rights defender in the Philippines, she wished everyone a productive session in Geneva and thanked the delegation for sharing their views with the European Parliament. Vergiat is a member of the EU Committee on Civil Liberties, Justice and Home Affairs. The Philippine UPR Watch delegation is in Europe for the Third Cycle of the UN Universal Periodic Review (UN UPR) of Human Rights in the Philippines to be held May 8 in Geneva where Senator Alan Peter Cayetano is expected to deliver the Philippine government’s report on the implementation of recommendations made during the previous UPR in 2012. The 3rd Cycle of the UPR of the Philippines will cover the last three years of the Benigno Simeon Aquino III presidency up to the first months of current president Duterte. Nardy Sabino, General Secretary of the Promotion of Church People’s Response opened the delegation’s presentation. “The election of President Rodrigo Duterte was brought about by the Filipino people’s frustration over the failure of past administrations to deliver on their campaign promises… They thus, overwhelmingly placed their votes behind the candidate who not only promised to end corruption, poverty and criminality, but behind someone who is largely projected and believed to have led the “cleanest and safest” city in the country”, he added. “EJKs and various other human rights violations (HRVs) mostly directed against peasant farmers and indigenous people under the watch of former Presidents Benigno Simeon Aquino III and Gloria Macapagal-Arroyo have continued under President Duterte,” said UPR Watch delegation member Johanna de la Cruz of the National Council of Churches in the Philippines (NCCP). “Perpetrators of these HRVs, even from the time of the dictator Ferdinand Marcos, are not made accountable for the violations they commit thus emboldening to continue to repress the fundamental rights of the people”, she added. The UPR Watch likewise shared with the MEPs the Executive Summary of their report including the recommendations they earlier submitted to the United Nations Human Rights Council (UNHRC) and its member countries through their embassies in the Philippines and Permanent Missions in the UN in Geneva. In conclusion, UPR Watch delegation member Dr. Angie Gonzales, Coordinator of the International Coalition for Human Rights in the Philippines (ICHRP), shared the successes of the latest round of peace negotiations between the Government of the Republic of the Philippines (GRP) and the National Democratic Front of the Philippines (NDFP) in advancing the people’s agenda for genuine development. She further pointed out that the Peace talks hope to address the roots of the armed conflict in the country as they are now discussing much needed socio-economic reforms.